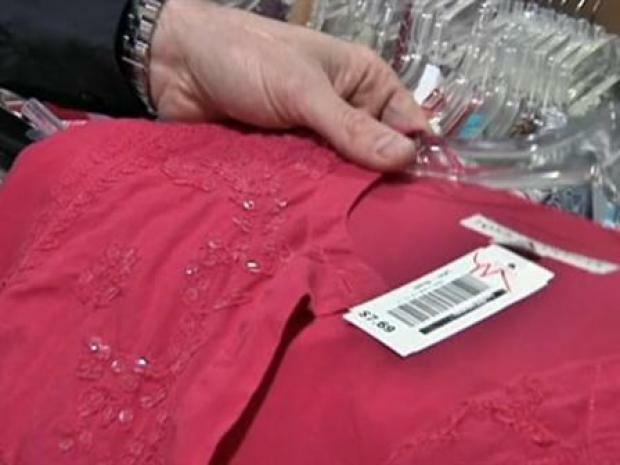 Women are racking up bargains at area Goodwill stores. In a tough economy, shopping for new clothes is almost a luxury. Yet week after week, women are racking up bargains at area Goodwill stores. "I'd rather buy resale and maybe pay a third of retail than pay full price and get one item," said Sheila McBride, a regular Goodwill shopper. There are 24 stores in North Texas stretching into Collin, Dallas, Denton, Parker and Tarrant counties. And bargain hunters are giving Goodwill one of its busiest years. "People are being really creative and trying to find different ways to save money, and one of those ways is to shop secondhand," said David Cox, senior vice president of retail sales and marketing for Goodwill Fort Worth. "It's very popular right now." North Texas shoppers rack up brand-name bargains at area Goodwill stores. At a recent stop at the Goodwill store in Bedford, Cox showed NBCDFW an Ann Taylor Loft shirt for $5.49, a Tommy Hilfiger shirt going for $7.69, along with items from Bath & Body Works, Coach and Prada. "The prices are so cheap," shopper Pam Pereira said. "I haven't shopped in a department store in 10 years and still wear nothing but designer clothes." But at a time of high demand, supply is low. Cox said donations in the 14 stores run by Goodwill Fort Worth are down 10 percent from this time last year. Donations at the Dallas area stores are on par with 2008. "For the most part, it's people scared of the economy, what the future holds, so they're not shopping as much and not donating as much," Cox said. New mom Tricia Dixon is one of them. The arrival of daughter Bella nine months ago shifted her charitable donations. "My husband and I have always donated our clothes to Goodwill, but when it came to Bella, we thought, 'Who do we know who needs them?'" she said. In tough times, neighbors are helping neighbors. Goodwill said it sees itself as part of that circle, too. "We encourage them to come into Goodwill and get their new clothes for a lot less, then pass the old clothes onto Goodwill," Cox said. "We're just trying to get the word out that Goodwill is a good cause -- recycle things and recycle the lives of people who come to Goodwill for help." Goodwill's mission is to employ people with disabilities, and the resale stores fund that work. And for those looking to make a good deal even better, Goodwill stores routinely cut prices in half either weekly or monthly.